What exactly is "gray" hair at dogs? "Gray" is a mixture of white and black hair. Gray animals are born black and will dilute by time. The nose stays black. The gray coat should not be mistaken as a blue. Prof. Bernard Denis writes, grey is a modified coat. Definition: The basic coat can still be identified but has undergone modifications which have changed the aspect. Three procedures have been retained: greying, mottling, spotting. The coat is normal during the first weeks of life; thereafter whitish hairs appear to various degrees. All coats can go grey. A description is classic: grey, which corresponds to a mix of black and white hairs (the animals are black at birth). Greyish-beige (mix of brown and white) and red-roan (mix of fawn and white) can also be included. Dr. med. vet. Chiara Noli writes about: real blue dogs have a single coat color with unicolored hair. This is a "dilution" kind of black and called "blue". It can appear like gray like slate or light like mice- or silver-gray. It appears congenitally in all hair and at the nose. Definition: They contain only one pigment, dark, pale or none at all. We therefore distinguish three types : dark, pale or white coats. The blue (dilution of black) coat is obtained by dilution of the black pigment. The nose is blue. Animals are blue at birth. Variations of shades are possible. This is the reason why gray coat, which is a mixture of black and white hair, cannot be called as "blue". A GRAY Poodle has to be born with black hair which will dilute by time to a uniform coat. This coat is a mixture of white and black (more or less gray, partly transparent and bronzed black) hair. Our silvers, grays, dark-grays and deep-dark-grays are scientifical all GRAY Poodles. The FCI name has it's right and gave us the opportunity to use the whole color-palette of gray - from the light "silver" until to the dark (false named) "blue". Must be uniform, deep, neither blackish nor whitish. Between "neither blackish nor whitish" is a big variation of many shades of gray color. That means for us, currently are the called "Platinum" and the very-dark-gray (in the scene known as dark "blue") not welcome at FCI. We deeply hope this soon will be changed in the whole FCI territory. All gray poodles with silver-gray ancestors in their pedigree, which will dilute, earlier or later, to a lighter or darker gray, should be recognized as "grey". 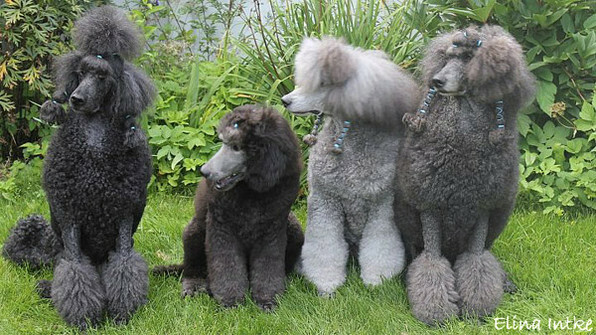 The dark-greys / middle-greys are 100 % gray poodle according to the Standard. They are mostly called as lighter "blue" in the poodle scene. They are neither "blue" scientifically nor as per FCI-Standard. They are just dark-gray poodle, with a stronger gray color. Every darker gray poodle, which is prohibited for breeding, only for his color (and not because of his body structure / temperament / health) is a big loss for all gray poodles in Europe, because of the currently very small gene pool. 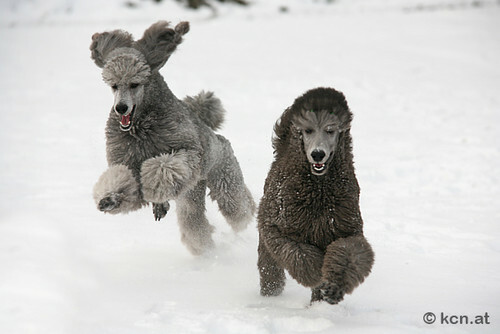 In the meantime, in Scandinavia are many examples of litters with darker gray poodles, which brought some of the most beautiful and uniform colored silvers. Notice: these words are mainly about breeding and not about shows. Why are the hair different? 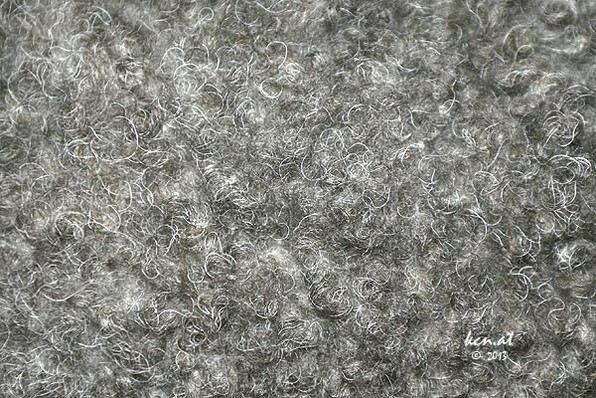 Silver poodle coat is a mixture of white, gray, transparent, black and bronzed black hair. The guard hair is mainly black and white. This kind of hair grows faster than the undercoat.